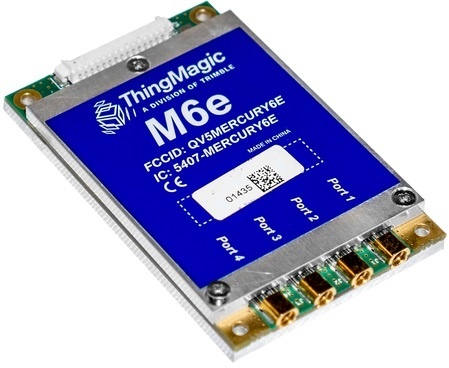 ThingMagic Mercury6e (M6e) embedded UHF RFID reader module offers world leading performance, form factor, and time-to-market advantages to OEM, Value Added Reseller, and Solution Provider customers. It is designed to the performance standards of full size readers, but is small and efficient enough to be used in mobile applications. The M6e supports 4 ports and will operate to a level of +31.5 dBm. Serial and USB interfaces are provided to support both board-to-board and board-to-host connectivity.